Hawaiian Airlines has earned the first-ever aviation based carbon credits having reduced its carbon dioxide (CO2) emissions by nearly 22,000 metric tons over the past six years using an innovative, eco-friendly engine washing technology developed by Pratt & Whitney. 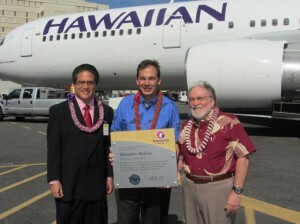 Maui’s State Senator J. Kalani English and Governor Neil Abercrombie were on hand at the Honolulu International Airport today to present a plaque to Mark Dunkerley, the president and chief executive officer of Hawaiian Airlines. 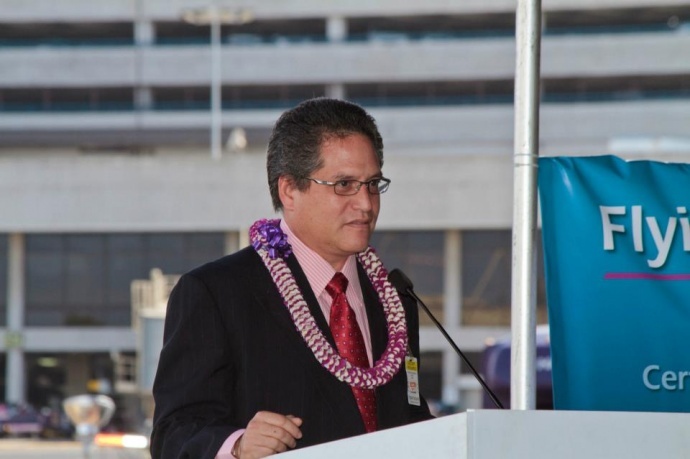 “Congratulations to Hawaiian Airlines — the first in the world to use this technology,” said State Senator English, in a post on his Facebook page. 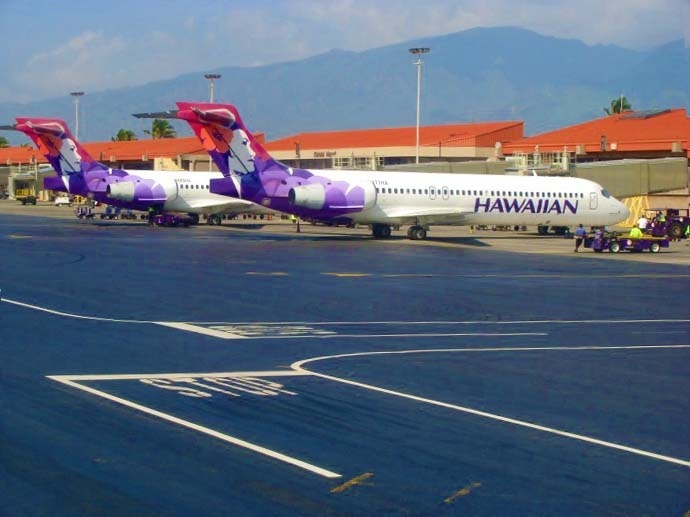 Hawaiian’s reduction of CO2 emissions using Pratt & Whitney’s patented EcoPower engine washing system has had the equivalent effect of taking 700 cars off the road annually. 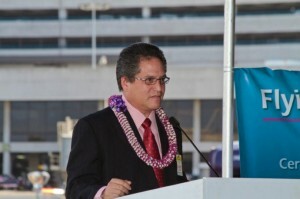 Maui's State Senator English congratulates Hawaiian Airlines on its accomplishment. 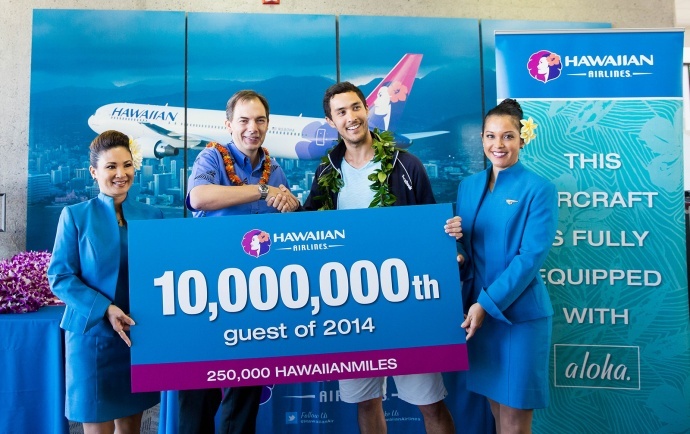 Courtesy of Hawaiian Airlines. A carbon credit is a verified means of measuring the reduction of industrial CO2 emissions from the environment, with one credit equal to the removal of one ton of CO2. Hawaiian’s earning of carbon credits has been quantified and certified under the Verified Carbon Standard, the world’s leading independent standard for the measurement and verification of greenhouse gas emissions and the creation of carbon credits. 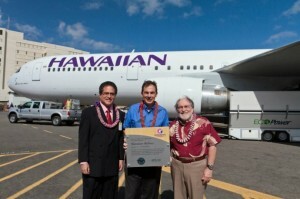 In addition, since launching the program in 2005, Hawaiian’s commitment to the engine-washing system has saved the company more than 2.5 million gallons of fuel, along with an estimated 26,000 gallons of water that would have been used with traditional washing methods. The company is also part of an airline industry movement to support development of clean-burning alternatives to petroleum-based fuel for powering jet engines.